If you enjoy making delicious dishes, then you may want to look into a meat grinder. Yes, using them in homes may be outdated perhaps, but there are still people out there that love doing things themselves, and there is nothing wrong with this. In fact, many will tell you that a meat grinder is something that you must have in your kitchen! You see, by grinding up your own meat, you’ll know exactly what is in it – when you purchase pre-packaged ground meat, it could have additives and fillers in it. 1 What Are Meat Grinders for? 2 Why Use a Meat Grinder? What Are Meat Grinders for? Meat grinders can be used to grind up your meat in order to make the most delicious dishes ever – you can even use them to make sausages. You can also grind up cheese, vegetables, buts, and even make pasta sauces. As an added benefit, it is cheaper to grind up your own meat, than to purchase ground beef. One of the best reasons to use a meat grinder (besides the fact that you’ll always know what goes in your meat) is because you are able to control how chunky or fine the meat is going to be (as long as you use a meat grinder that has those features). When it comes to purchasing a meat grinder, you will have two options – manual or electric. Personally, we recommend the manual meat grinder for a variety of reasons. Starting out, the manual grinders have a tendency to be smaller in comparison to the electric ones, which means they won’t take up a lot of room in the kitchen. They don’t feature electronic components, so they only weight a couple of pounds. For this reason, manual meat grinders are one of the smallest kitchen appliances out there. You also have to consider the fact that manual meat grinders don’t require an electric outlet, so you can operate it wherever you like. This comes in handy if you have a kitchen that is limited with outlets, or if you prefer working on a table that isn’t near an outlet. Finally, manual grinders are much cheaper in price than the electric ones and that right there makes them a great choice, especially for those on a budget. The manual meat grinder you buy should not be flimsy or made from fragile materials – if so, it isn’t going to last. We’re going to lend you a helping hand by introducing you to the best manual meat grinders currently on the market. If you’re on the market for a meat grinder that is compact and sturdy, then the Gideon hand crank meat grinder might just be the one for you. This meat grinder has two stainless steel plates for coarse or fine grinding. You can easily make gourmet burgers, sausage, meatballs, and so on. As an added bonus, you can even puree your vegetables and mince your garlic with this grinder. On top of all of this, it is portable, which means no electricity is required. You can easily take your grinder with you to your next gathering and impress your family members as you grind up the freshest meats and vegetables they’ve ever experienced. It is surprising how easy the meat grinder is to use. All you have to do is place your meats (or vegetables) into the grinder and start turning the hand crank. Right before your eyes, the meats turn into a nice ground paste that is ready to be cooked. On the bottom, there’s a powerful suction base in order to make sure the meat grinder remains in place. All you have to do is turn the knob, and the grinder will secure itself to any flat surface. Another meat grinder that has made our “best of” list is the Zalik 4-in one meat grinder. In no time at all, this manual meat grinder can mince both meat and vegetables. Simply by turning the crank, you can mince vegetables, herbs, beans, and meat. As an additional feature, you will also be able to make yummy smoothies and juice every morning. For those summer days, you can gather the family together and make ice cream with the additional ice cream accessory that allows you to take your frozen fruits and transform them into ice cream. 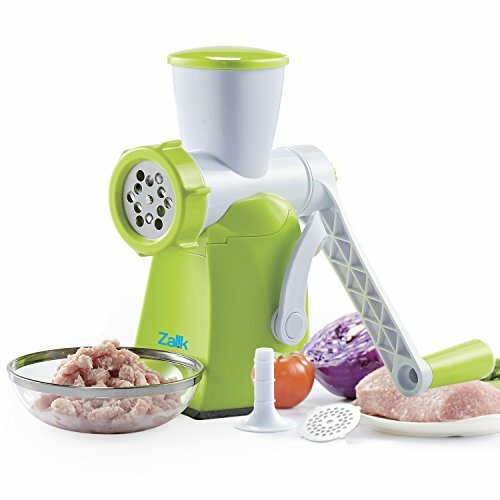 The Zalik 4-in One Meat Grinder has two stainless steel discs that you can use in order to mince your meat and veggies in coarse or fine pieces. By using the fine mincing option, you will be able to make your own homemade vegetable or fruit puree that is perfect for sauces as well as baby food. This is a portable grinder, so no electricity is required. All you have to do is turn the handle to grind the ingredients inside. 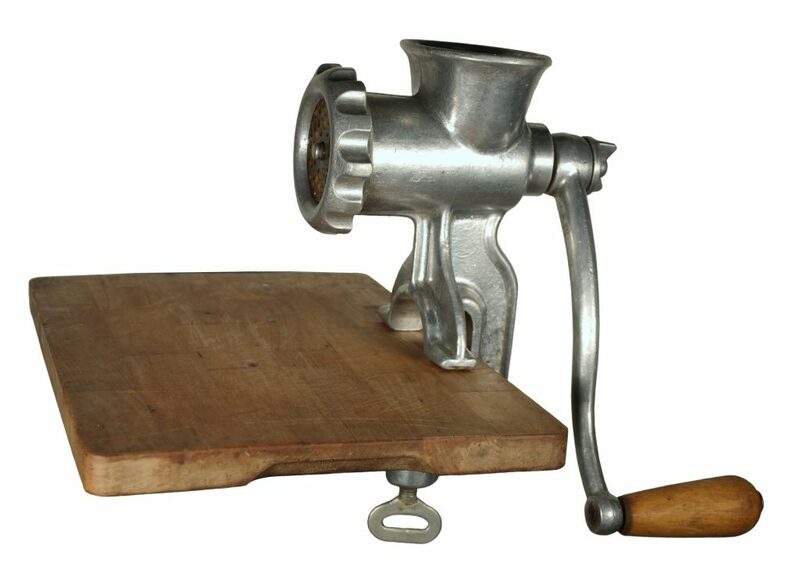 Another manual meat grinder that we believe belongs on this “best of” list would be the Bellemain manual meat grinder. 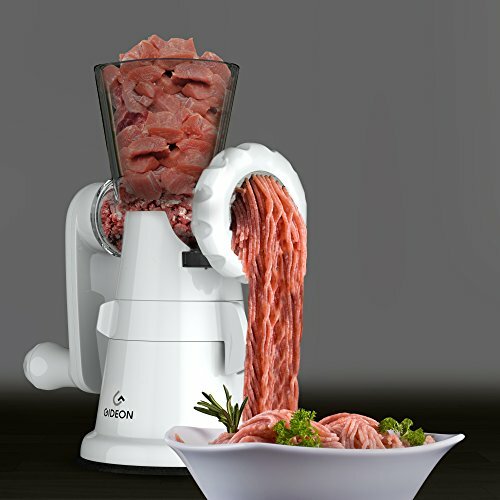 If you have been wanting to grind up your own meat, then this grinder might be a suitable option for you. 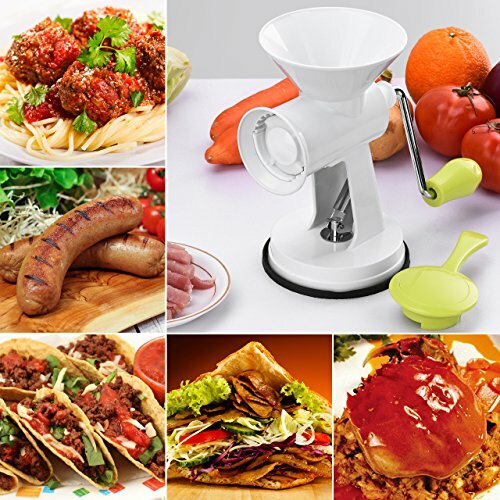 With this grinder, you can make burgers, tacos, meatballs, pasta sauces, hashes, salads, and so much more. It even has a suction base that anchors the grinder to the counter, so you don’t have to worry about it tipping while it’s in use. Apart from this, since it’s created from durable plastic and stainless steel, you can rest with the satisfaction of knowing it’ll last for years. It’s not intended for heavy, high volume grinding, but for average family use, it is one of the best. A meat pusher is included with this one – the meat pusher will keep your fingers safely away from the blade. In the end, it is easy to clean and store – all of the parts are dishwasher safe, and it is simple to take apart. When it comes time to store the grinder, it’s not going to take up a whole lot of storage space in your kitchen. Last on the list, we have the Pickteck meat grinder that you can use to make a large variety of fine dishes. You can even use it to push down meat and vegetables, making them easy to grind. The handheld uppercut comes in handy for preventing food splash when swirling. With the Pickteck Meat Grinder, you can easily and quickly grind meat, beans, vegetables and even garlic. This one also has a strong sturdy suction cup on the bottom – it sticks to the non-porous surface. Using this meat grinder isn’t rocket science – no special skills are required. Simply swirl the handle with the vegetable or meat in the funnel cup and watch the magic take place. In the end, the simple structure easily comes apart, so you can clean it. We took a lot of time and conducted a large amount of research in order to find the 4 best manual meat grinders. If you choose one from this list, then you can rest with the satisfaction of knowing you have made a wise choice.